A Leamington pub’s assistant manager has escaped being jailed after stealing more than £20,000 to fund his addictions to gambling and recreational drugs. Thomas Foster, who was assistant manager at the Copper Pot pub in Warwick Street at the time, pleaded guilty at Warwick Crown Court to theft from the Greene King brewery. 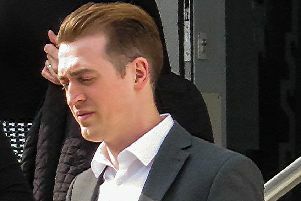 But after hearing that Foster, 29, now of Pyrton Mews, Up Hatherley, Cheltenham, was taking steps to tackle his problem, the judge imposed a 12-month prison sentence suspended for two years. In addition, Foster was made subject to a rehabilitation requirement for ten days and ordered to do 150 hours of unpaid work. Prosecutor David Bright said that at the time of the thefts in January and February, Foster was employed by Greene King as the assistant manager of the Copper Pot. But in February the pub was the subject of an audit which disclosed a short-fall of a total of £20,588. The police were contacted, and when Foster was arrested, he confessed, attributing the theft to ‘an addiction to gambling and recreational drugs’. “He said that in hindsight it was a terrible thing to do, and he had learned from it and felt totally ashamed. He said he would do all he could to pay it back,” added Mr Bright. Rashad Mohammed, defending, said Foster, who had no previous convictions, has been seeking assistance to tackle his gambling addiction. Mr Mohammed said Foster had been living in Lanzarote for four years, working in a bar, and had been visited by members of his family, including his 18-month-old nephew. “A door had been left open, and his nephew managed to get out and fall into a swimming pool where he drowned. “That had an effect on Mr Foster, and about two months after that his then-partner suffered a miscarriage. “He has always gambled, but never to extreme. But in December he began gambling greater amounts of money as a reaction. “At first it was his own money, but then money which should have been paid into the bank. “He had every intention at the start to pay it back; and after he had taken the first sum of money, he had paid it back, but then continued and it spiralled out of control. Mr Mohammed said Foster helps with youth organisations, and ‘wishes in due course to become a primary school teacher,’ and it was unlikely a court would ever see him again. He added that Foster wants to pay the money back, and has spoken to his father, who has indicated that they will ‘sit down and see if there’s a way he can obtain a loan’ to do so.